Grantley Adams International Airport Inc. has signed a contract agreement with two Chinese corporations, Anhui Foreign Economic Construction Group (AFECC) and China National Complete Plant Import & Export Corporation Limited (COMPLANT) that will give it access to a loan facilitated by the China Ex-Im Bank for the future expansion of the airport. 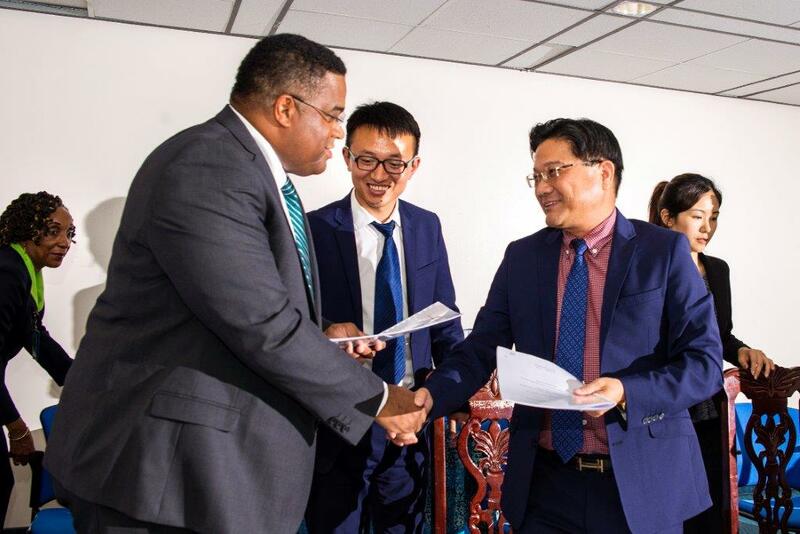 The event took place on Tuesday, September 20th, at the GAIA Inc offices and was initialed by GAIA Inc's Chairman Adrian King, AFECC’s Chief Executive Officer Hao Wang and COMPLANT's President Hui Zhang. The project involves the expansion of the airport's Terminal building and airside pavements, which will include runway resurfacing and additional parking aprons. Upon completion, there will be increased capacity for both passengers and aircraft, upgraded terminal facilities, thus enabling the airport to continue to provide the highest level of service to the travelling public and the wider aviation community. GAIA Inc Chairman, Adrian King shakes hands with Executive President of AFECC, Hao Wang shortly after signing the contract.